With so many arts institutions around the world, it is a challenge for galleries to stay noticeable and keep the public informed about what they have to offer. If you want the public to stay up-to-date on your gallery shows and have easy access to your information, See Saw may be the app for you. See Saw is an app designed to advertise major gallery shows, provide exhibition information, and allow users to map a route for the exhibitions they wish to see. The app is great for reaching people who want to engage in their local arts scene and tourists who are interested in experiencing the art of a new location. For galleries that wish to reach new audiences, it is a wonderful advertising platform. Search by artist, location, or gallery. See Saw allows users to search for specific artists, locations, and galleries. The app has information on five major arts cities: New York, Los Angeles, Berlin, London, and Paris. Users can browse a listing of galleries and exhibitions throughout an entire city or select/search specific neighborhoods to browse within those cities. If users are interested in a particular artist or gallery, their information is just one quick search away. This specific and detailed search feature allows users to find exactly what they want in whatever location they want without frustrating internet searches. With See Saw, galleries can be sure that the public can find their information based on whatever a user is most interested in; location, artist, or gallery name. View images and information on exhibitions. See Saw includes high-quality images of gallery shows, giving users an exciting preview of what your gallery has to offer. In addition to the images, See Saw includes dates of exhibitions, location of galleries, hours of operation, contact information, and press releases. Users don’t have to search through websites or conduct multiple online searches – all the information about your organization is right in front of them in one easy-to-use app. With one click, users can even add your gallery to the map provided in the app, making your exhibitions easily accessible when they are ready to visit. 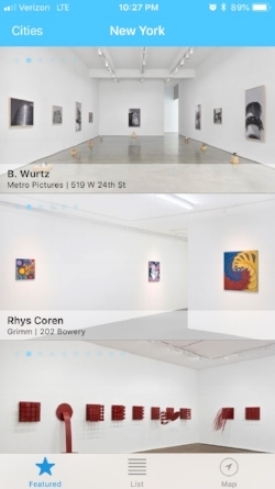 With this app, interested patrons can find galleries quicker and easier than ever. Share with friends. If you’ve ever wanted to make plans with friends, you know that communicating information about an event can be a hassle. See Saw allows users to easily share exhibition information via Messenger, Notes, Twitter, Facebook, and many other social apps. The app even has a direct link to Instagram, making sharing arts opportunities with the world easier than ever. Advertising through See Saw is a simple way for a gallery to share itself with the world directly through interested patrons. Getting on the App. Because See Saw is still relatively new and growing, being included in the app is a straightforward process. All you have to do is contact the creator, Ellen Swieskowski, requesting to be added to her app. If you can make a compelling case for your gallery, it is reasonably likely to be added. See Saw’s easy-to-navigate, informative, and convenient structure is a great way to let the public know about your gallery. Whether you’re interested in attracting art experts or people just looking for a fun arts experience, See Saw is a useful method to advertise your gallery in an efficient way.